Preheat oven to 375°F. 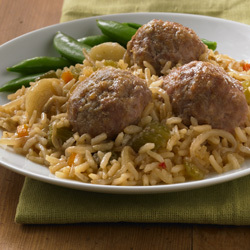 Combine rice, vegetables, water and 3/4 cup stir fry sauce in 11x7-inch or shallow 2-quart baking dish; set aside. Combine pork, remaining 1/4 cup stir fry sauce and bread crumbs in medium bowl. Divide pork mixture into 18 portions; shape into 1-inch balls. Place meatballs on top of rice mixture (meatballs will sink slightly). Cover and bake 30 minutes or until meatballs are cooked through (160°F).